A pitiful French-made 4 x 4 camera. 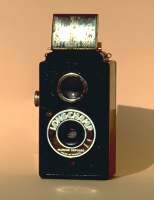 The most ridiculous camera ever made. A kind of Rollei as seen by the Marx Brothers : a (more or less) f/4.5 45 mm single element lens, an inept viewfinder, two shutter speeds : what seems to be 1/100 s and B pose (without cable release). Made in France, but if you're asked please say you don't know.